Um, we all love a half day from work am I right? I did just that, broke my gal out of preschool early with a little help from Gett and Porsche and we set off cruising around London for the afternoon for a little adventure and some quality mummy and daughter time. With work being so hectic at the moment I've not been able to get some little dates in with my gal, just me and her, her and me. Racking my brain on what we should do where we should go, not that it would matter much, as long as I am with her is the main thing, but I wanted it to be, in Leanora's words 'The best day ever'. So when Gett got in touch, I hatched a plan on braking my gal out in style and day filled with fun. Travelling around with a toddler can be super stressful, especially when you do not drive, so I have been relying heavily on my Gett app to get us round in comfort, less stress and in style as well as being hassle-free, especially as we do not have to find or pay for any parking, so makes it easier for us to hop in and hop out of our car. 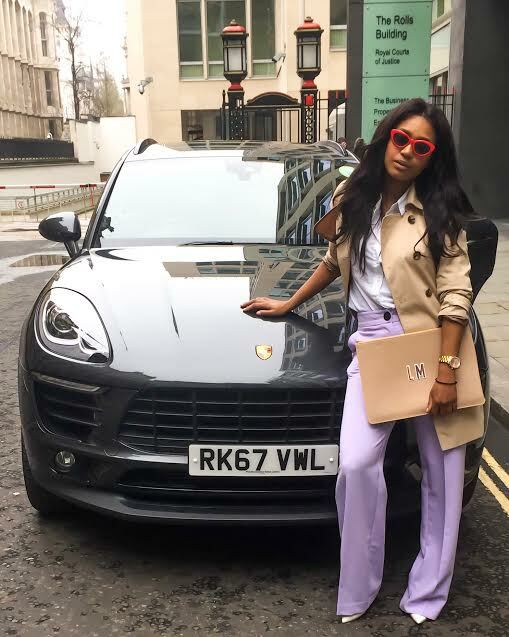 Porsche ordered from our Gett app, laptop shut down, jacket on, I said peace out to the ladies in the office and I made a beeline to the exit of the building, and slid into the waiting, open doors of our chariot for the day. We set off across London to get Leanora, not before a few quick work calls and answered emails, I know what can I say I'm a workaholic, but with phone and iPad charges available it would have been rude of me to not of taken advantage to get some quick emails in. Scooped Leanora out of preschool we bounced into the car and set off for our first adventure, the Natural History Museum, to see the Butterfly exhibition. The look on Leanora's face was pure bliss, she is nuts about butterflies, if we could I am sure she would have taken them home, Milo I am sure would have been pleased. I'm not gonna lie I was a bit of a scaredy cat, things flying around and what could potentially land and poop on you I wasn't 100% keen on it, but I had to man up, I mean if I can give birth I can sure as hell face beautiful butterflies. So I did, with flying colours. Still keen to enjoy roaming around we headed out of the butterfly tent and set off around to explore so more wonders of the museum. Not realising how hungry you can get from roaming the museum. I decided it was high time to set about calling our Gett x Porsche to take us to dinner at our new fave pizzeria, Pizza Pilgrims. For me and most parents, saving in any form is a bonus, and I love the fact you can earn points when booking with the Gett app and work your way towards saving money from future rides. Another bonus is, you can also get to choose the music before you get in, choose how chatty your driver is too, which is perfect if you have chatty toddlers like Leanora and tired Mumma's who just wanna kick back when we head home. This post is in paid partnership with Gett app.